The television interview series A Good Goodbye: Funeral Planning for Those Who Don’t Plan to Die just won an award in the National Federation of Press Women’s (NFPW) 2014 Communications Contest. A Good Goodbye TV took second place in the Television Talk Show category. The educational and entertaining 12-episode series of 25-minute programs with expert interviews on “everything you need to know before you go” won first place in the New Mexico Press Women Communications Contest before going on to national competition. The annual NFPW Communications Contest encourages and rewards excellence in communication in a wide range of categories, with entries judged by leaders in their fields of expertise. NFPW contest winners are honored at the annual NFPW Communications Contest Awards Banquet at the organization’s annual convention in the fall. The DVD set of the series is currently available for $49.97 through Amazon.com and AGoodGoodbye.com. The anchor sponsor of the series is the FRENCH Family of Companies: FRENCH Funerals-Cremations, FRENCH Advance Planning, Sunset Memorial Park, Best Friends Pet Services, Best Friends Forever Pet Cemetery and Cremation Society of New Mexico (CSNM). For more information on the DVD series, visit https://agoodgoodbye.com/radio-tv/a-good-goodbye-tv-series/. 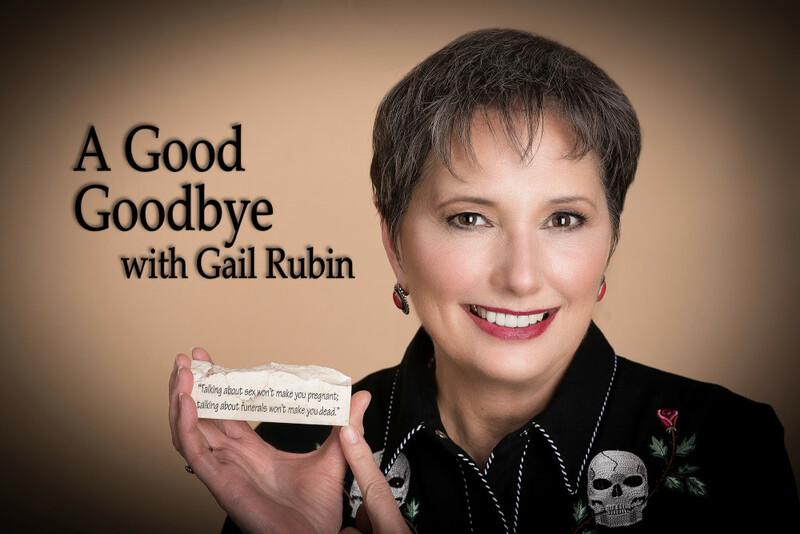 Gail Rubin, CT, The Doyenne of Death®, is author and host of the award-winning book and TV show A Good Goodbye: Funeral Planning for Those Who Don’t Plan to Die (www.AGoodGoodbye.com). A popular speaker who uses humor and films to get the funeral planning conversation started, she’s also a Certified Thanatologist (a death educator) and Funeral Celebrant. Rubin is a member of the Association for Death Education and Counseling and the International Cemetery, Cremation and Funeral Association. She’s President of the Jewish-Christian Dialogue of New Mexico, helping to start conversations across religions. She is well versed in Jewish funeral and burial traditions.